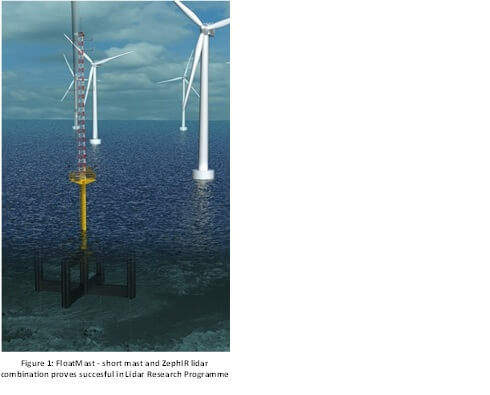 Home » News and Events » Lidar Research Programme 1st project announcement: Novel combined floating lidar + mast using the expertise of research institute CRES, floating mast company FloatMast and industry leading wind lidar ZephIR 300. Lidar Research Programme 1st project announcement: Novel combined floating lidar + mast using the expertise of research institute CRES, floating mast company FloatMast and industry leading wind lidar ZephIR 300. The aim of the project is to demonstrate that a mini tension leg platform (TLP), with a short met mast and a ZephIR wind lidar, can provide data of high accuracy using the established onshore methodology for financing wind energy sites – a DNV GL Stage 3 lidar, such as ZephIR 300, and on-site mast data. The high data availability and accuracy of cup anemometers, combined with ZephIR lidar’s proven precision to measure the wind shear, are likely to carry significant impact on the offshore wind sector, providing a novel method for lowering the cost of offshore wind measurement campaigns. Further, where the short met mast intersects with the lowest tip of the blade then compliancy with the draft IEC 61400-12-1 standard could be met. Alex Woodward, Head of Product Development at ZephIR Lidar commented: “The Lidar Research Programme was designed to unlock interesting applications of ZephIR lidars. This project was finally selected as it offered a timely novel combination of floating mast and lidar that may well be compliant with future IEC 61400-12-1 power curve measurements. Offshore, our extended service and warranty periods with no need for annual calibration delivers real benefit to CRES and FloatMast. We look forward to seeing the results and, with ZephIR’s low susceptibility to motion induced errors, we continue to see real benefit when compared to other devices when validating novel applications of traditional met masts such as these.